The Route: 1,400+ Miles: We Could Have Driven Halfway Across North America! 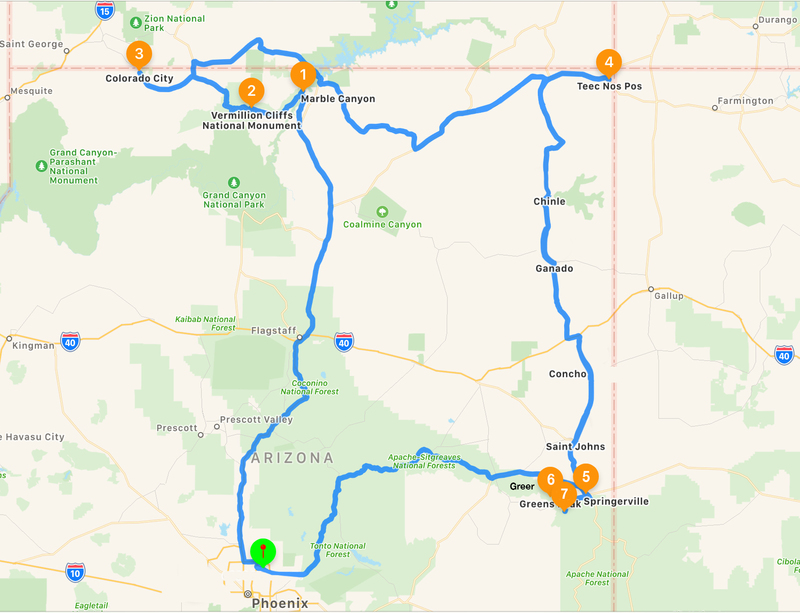 The 1,400+ mile route we took over four days of birding across Arizona. Driving across middle America is approximately 2,800 miles - only twice the distance we drove on our birding blitz across the region known as the Colorado Plateau. I have been fascinated by the geology of the Colorado Plateau since the late 1960s when one summer my family traveled cross-country in an RV. My young mind saw sailing ships, ladies in billowing dresses, birds and animals in the brightly colored sedimentary rock formations, laid bare in the otherwise flat-lying area by millions of years of erosion. I was dazzled by the dramatic vistas at the Grand Canyon and speechless at the sight of Hoodoo spires in Bryce Canyon and the sheer rock walls of the Mogollon Rim, which defines the southern most part of the plateau. Where else on earth can you witness such diverse landscape from high and low desert to sandstone cliffs, from volcanic ranges to mixed conifer forests? John Wesley Powell knew there was no marble when he named it Marble Canyon, but he thought the polished limestone looked like marble. In his words, "The limestone of the canyon is often polished, and makes a beautiful marble. Sometimes the rocks are of many colors - white, gray, pink, and purple, with saffron tints." Our first destination, Marble Canyon, was 266 miles and just over four hours northwest of Phoenix. 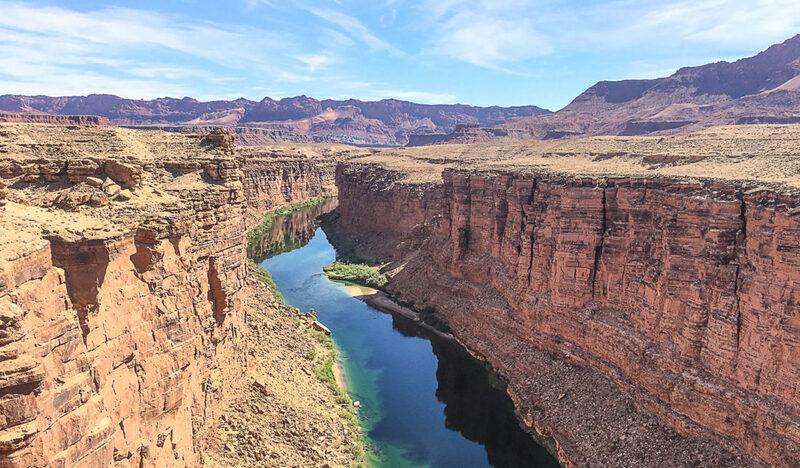 The canyon is a section of the Colorado River canyon from Lee's Ferry, a common launching point for river runners, to the confluence with the Little Colorado River, which marks the beginning of the Grand Canyon. Target bird: California Condors, known to perch in the steel supports of the Navajo Bridge that spans Marble Canyon nearly 500 feet above the river. These magnificent birds have made a remarkable come back from near-extinction 30 years ago thanks to a captive breeding program begun in 1983. The bridge and interpretive center on the west side were worth the stop, but we found no condors out in the already hot day. We pushed on to the Vermilion Cliffs National Monument, a remote 294,000-acre monument managed by the Bureau of Land Management and an international hiking destination. Of special interest to us, however, was the Condor release site where each September the public is invited to watch the release of new fledglings back into the wild. We could see the cages atop the far-off cliffs and searched through our bins and scope for any sign of the giant birds. Suddenly there one was, rising up over the top of the cliffs like the mythical Greek phoenix arising from the ashes of its predecessor. 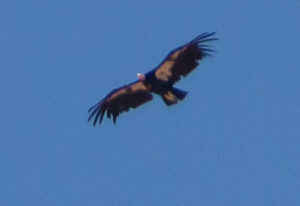 Then another soared up over the cliffs and another until there were seven California Condors effortlessly gliding on the thermals above our heads. What an amazing sight! Another 75 to the northwest took us to Colorado City, a nondescript town at the Arizona/Utah border. It has made international news over the years, but we weren't there to sight see. We were there to find Black-capped Chickadees, which had been spotted nesting in a local park. Normally their range is in the northern reaches of the U.S. and out to the east coast. After an hour or so of searching, we were just about to give up when we spotted a single bird singing in an Arizona Sycamore. I see funky chickens. What do you see? Feeling the flush of success, we headed east, nearly 300 miles and 4.5 hours later to reach our harbor for the night: Kayenta, a city in the Navajo Nation. On the way, we passed through Monument Valley where vast sandstone buttes rise out of the flat desert floor like islands popping up over the horizon. 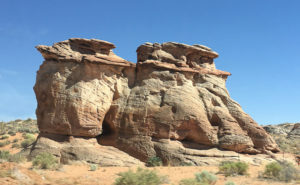 The area has been featured in many movies since the 1930s and has become what decades of moviegoers think of when they imagine the American West. We rose early to begin our hunt in Teec Nos Pos, another reservation city 75 miles to the east and the closest settlement of any size to the Four Corners Monument where Arizona, New Mexico, Colorado and Utah meet. The Navajo name of this community translates as "cottonwoods in a circle," which is the perfect habitat for our target bird, the Black-billed Magpie. This is the only reliable place in Arizona to find this large, flashy relative of jays and crows. I was told that normally they can be heard before they are seen, but we didn't hear or see any birds except Common Ravens as we searched the tops of the cottonwoods along the dry wash. Our efforts were further hampered by strong, gusty winds so that when we did find the lone Magpie, the distance and wind made it impossible for me to get a good photo. Too bad, because it is a stunning black, white and blue bird. 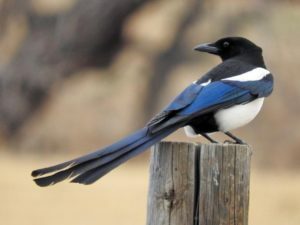 Historical records of the American West show that Black-billed Magpies have associated with people for a long time, frequently following hunting parties of Plains Indians and feeding on leftovers from bison kills. We had a long, 250-mile drive ahead of us so we didn't linger. As we descended from the Colorado Plateau, the scenery changed dramatically. Gone were the sandstone and volcanic formations of the high desert, replaced by green forested hills and lush, open fields. It felt good to be in the familiar territory of the White Mountains again as we settled into our rooms at Reeds Lodge in Springerville. This cozy lodge was built in 1949 to serve early travelers on U.S. Highway 60 and caters to birders and other outdoor enthusiasts. It's not fancy, but it's comfortable and clean and proprietor Roxanne, a 5th generation rancher, is very welcoming. "Don't be greedy." 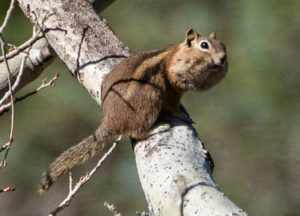 Seems this Rock Squirrel has bitten off a little more than he can chew! We started our day at Wenima Wildlife Area, which is managed by Arizona Game and Fish. Ten centuries ago, Hopi Native Americans settled along the Little Colorado in what would later be known as Wenima Valley. 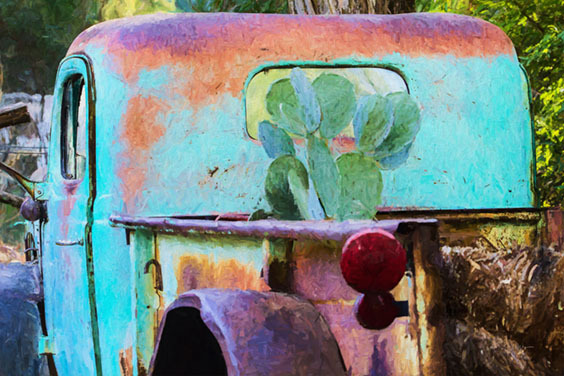 The word Wenima in the Hopi language means "Coming Home." This corridor of river riparian habitat stretches over two miles along the Little Colorado River and is protected by a series of crescent-shaped basalt bluffs. It is the only place you can find California Quail in Arizona, a species that was introduced to the area in the early 1930s by Reeds Lodge owner Roxanne's father at their Springerville ranch. Today, shooting Quail is not allowed in the Wenima Wildlife Area, except the kind we do with cameras. We were very fortunate to get fleeting glimpses and quick snapshots of these elusive birds. Most people only hear them. From there we drove south to Greer, elevation 8,356 feet, and hiked the Butler Canyon trail to locate an American Three-toed Woodpecker. As we stepped out of the car in the parking lot, I heard a faint drumming and at the start of the trail we spotted not one, but three - two adults and a juvenile - foraging for insects on fallen and damaged tree trunks. Most woodpeckers have four toes, but, as its name suggests, this woodpecker has only three. Ornithologists think the loss of the fourth toe may help deliver stronger blows, but at the expense of climbing ability. However, if these birds were climbing challenged, it wasn't noticeable as they scampered up and down the tree trunks, the adults teaching Junior where to find the best bugs. 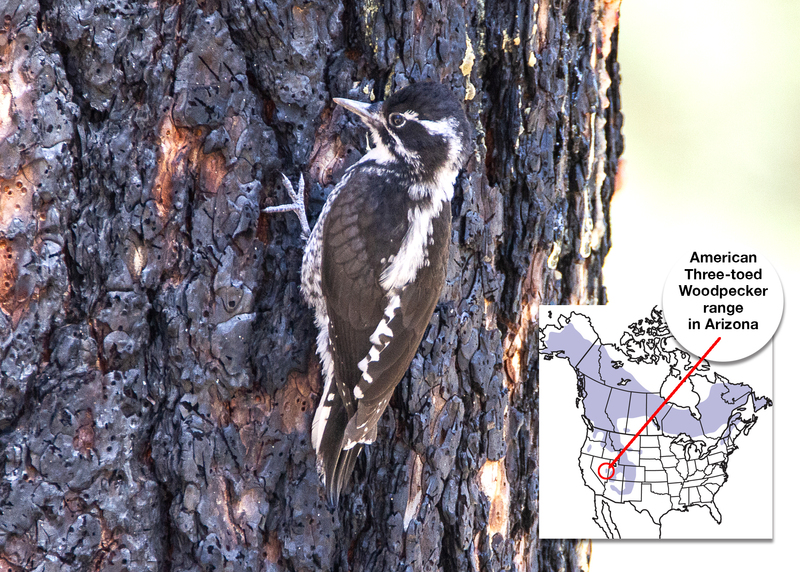 The America Three-toed Woodpecker can only be found in a small area of Arizona. We were fortunate to find three together in Greer. This is a juvenile who was getting lessons in climbing and bug hunting from his mum and dad. It was hard to tear ourselves away from watching and photographing these agile birds since they were so cooperative, but we moved on up the trail for about a quarter mile or more and found a Clark's Nutcracker, another target bird. 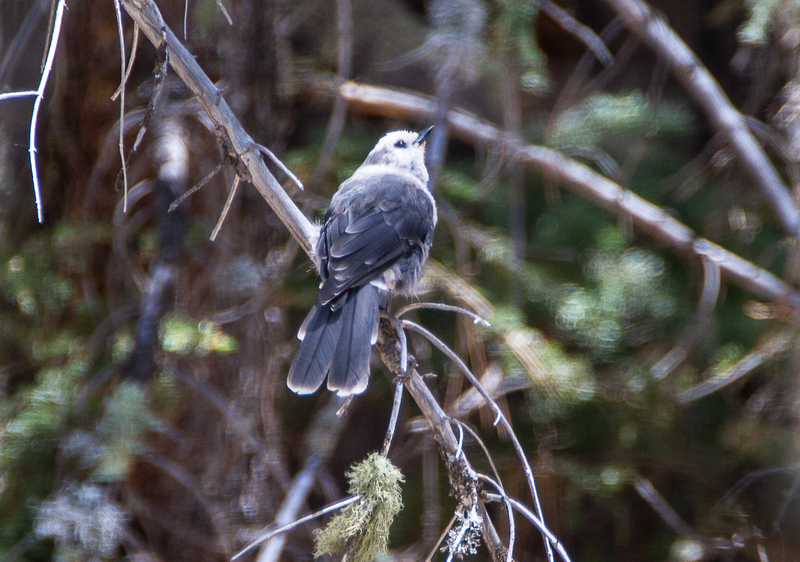 This gray bird with black wings is the size of a jay but shaped like a crow, with a short tail and a long, straight and sharp-tipped bill that it uses to pick seeds out of pine cones. What they don't eat now, they bury for the winter. Our last stop for the day was Sunrise Lake Campground, located just below the ski slopes at Sunrise Mountain Ski Resort. 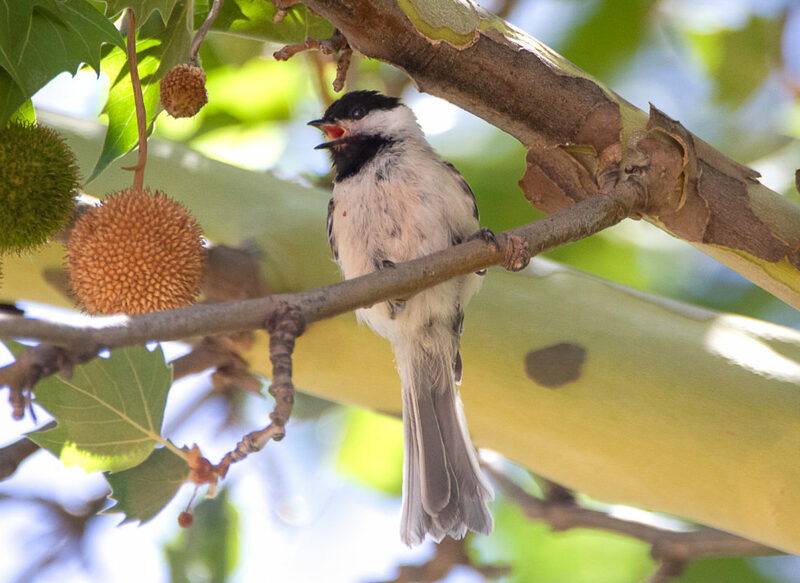 At 9,000 feet and surrounded by Ponderosas and Aspens, this campground is good habitat for Gray Jays, a highly curious bird that is always on the lookout for food. They'll eat just about anything, from berries to small animals and they may even land on your hand to grab a raisin or peanut. During summer they hoard food in trees to sustain themselves through bleak winters. The three that we found eagerly took the pieces of Fig Newtons that we offered as payment for allowing us to take their pictures! Gray Jays use sticky saliva to glue small food items to tree branches above the height of the eventual snow line, which allows the birds to live so far north throughout the winter. The 20-mile driving loop on unpaved Forest Roads (FR) 117 and 118 passes through high-elevation grassland, Ponderosa pine, Aspen and mixed conifer forest. The north slope of Green's Peak is a traditional place to look for elusive Dusky Grouse, near the top at elevation 10,099 feet where a fire watch tower stands and one has 360-degree, panoramic views. A helpful ranger told us the best places to look and within the first 30 minutes, we spotted our first, a hen with two fuzzy chicks in tow. The ranger, from her tall perch, was able to alert us to another hen on the other side of the clearing. 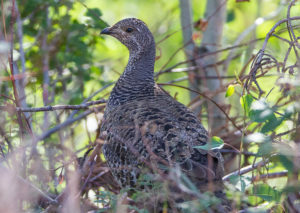 One of North America’s largest grouse, the Dusky Grouse used to be considered the paler, interior subspecies of the Blue Grouse. Recent DNA testing, however, resulted in the splitting of the Blue Grouse into two separate species, the Dusky Grouse and the Sooty Grouse. Even though we had found our target bird, we spent another couple of hours there, finding many other birds, including Mountain Bluebirds, Downy Woodpecker, Golden-crowned Kinglets, Green-tailed Towhees and a surprising Indigo Bunting. Heading home, we were mostly quiet, each reflecting on the once-in-a-lifetime experience we had just shared. Occasionally, one of us would bring up what an outstanding trip this was and the things we'd seen, the birds we were able to find. Out of our nine target birds we saw eight: California Condor, Black-capped Chickadee, Black-billed Magpie, California Quail, Three-toed Woodpecker, Clark's Nutcracker, Gray Jay and Dusky Grouse. Of those, five were lifers for me. That's a very successful trip in the birding world! My thanks to Susan and Brian for the outstanding experience. A commanding view from 10,000 feet atop Green's Peak. Incredible journey. You need to write a book (with lots of pictures). Thanks, Shelley. I may just do that! What a great trip, Lyndie. You do some awesome birding. 8/9 is pretty good. Who did you miss? Thanks, Candace. We didn’t not find any Pinyon Jays, but we went to the Flagstaff area a few days later and got it! Were you at Ashfork Lake? I heard they are there, I’ve never seen them before and would love to. No. I’m not familiar with Ashfork Lake. We found a singular jay a along the roadside. Most of the roads were closed due to fire restrictions, so we parked and walked in a little way.